St. Mary Church Altus 5 p.m.
St. Joseph Church Center Ridge 4 p.m.
Sacred Heart Church Charleston 6 p.m.
Holy Redeemer Church Clarksville 5:30 p.m.
St. Augustine Church Dardanelle 4 p.m.
St. Francis of Assisi Church Fairfield Bay 4 p.m.
Sacred Heart Church Morrilton 5:30 p.m.
St. Scholastica Church New Blaine 6 p.m.
St. Joseph Church Paris 5 p.m.
St. Meinrad Church Prairie View 5:30 p.m.
St. John Church Russellville 5 p.m.
St. Mary Church Saint Vincent 4 p.m.
St. Benedict Church Subiaco 6 p.m.
St. Mary Church Altus 9 a.m.
Church of the Assumption Atkins 8:30 a.m.
St. Boniface Church Bigelow 8 a.m.
Our Lady of the Assumption Church Booneville 9 a.m.
St. Joseph Church Center Ridge 9 a.m.
Sacred Heart Church Charleston 8 a.m., 10 a.m.
St. Jude Thaddeus Church Clinton 11 a.m.
St. Francis of Assisi Church Fairfield Bay 9 a.m.
Sts. Peter and Paul Church Morrison Bluff 8 a.m.
St. Scholastica Church New Blaine 9:30 a.m.
St. Elizabeth Church Oppelo 10:30 a.m.
St. Joseph Church Paris 9 a.m.
St. Anthony Church Ratcliff 11:30 a.m.
St. Leo the Great University Parish Russellville 11:30 a.m., 7 p.m.
St. Mary Church Saint Vincent 8 a.m.
St. Ignatius Church Scranton 10:20 a.m.
St. Benedict Church Subiaco 8 a.m.
Subiaco Abbey Subiaco 10:45 a.m.
St. Joseph Church Center Ridge 8:30 a.m.
Holy Redeemer Church Clarksville 8 a.m.
Sacred Heart Church Morrilton 7 a.m.
St. Ignatius Church Scranton 7 a.m.
Subiaco Abbey Subiaco 6:35 a.m.
St. Mary Church Altus 7:30 a.m.
Sacred Heart Church Charleston 7 p.m.
Sacred Heart Church Morrilton 5 p.m.
Sts. 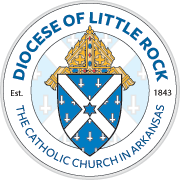 Peter and Paul Church Morrison Bluff 7 a.m.
St. Joseph Church Paris 7:30 p.m.
St. John Church Russellville 8 a.m.
St. Mary Church Altus 6 p.m.
Our Lady of the Assumption Church Booneville 6 p.m.
St. Joseph Church Center Ridge 7 p.m.
Sacred Heart Church Charleston 8 a.m.
St. Jude Thaddeus Church Clinton 5 p.m.
Sts. Peter and Paul Church Morrison Bluff 6 p.m.
St. Elizabeth Church Oppelo 7 p.m.
St. Joseph Church Paris 8 a.m.
St. John Church Russellville 8:30 a.m.
St. Andrew Church Danville Spanish 7 p.m.
St. Meinrad Church Prairie View 7 a.m.
Sacred Heart Church Charleston 9 a.m.
Subiaco Abbey Subiaco 7:30 a.m.
St. Boniface Church Bigelow 7 p.m.
Sacred Heart Church Charleston 8 a.m., 7 p.m.
Holy Redeemer Church Clarksville Vigil 5:30 p.m.; 8 a.m.
St. Scholastica Church New Blaine 11:30 a.m. (sisters' chapel), 6 p.m.
St. Elizabeth Church Oppelo Vigil 7 p.m.
St. Joseph Church Paris Vigil 7 p.m.; 8 a.m.
St. Meinrad Church Prairie View Vigil 5:30 p.m.
St. Ignatius Church Scranton Vigil 7 p.m.